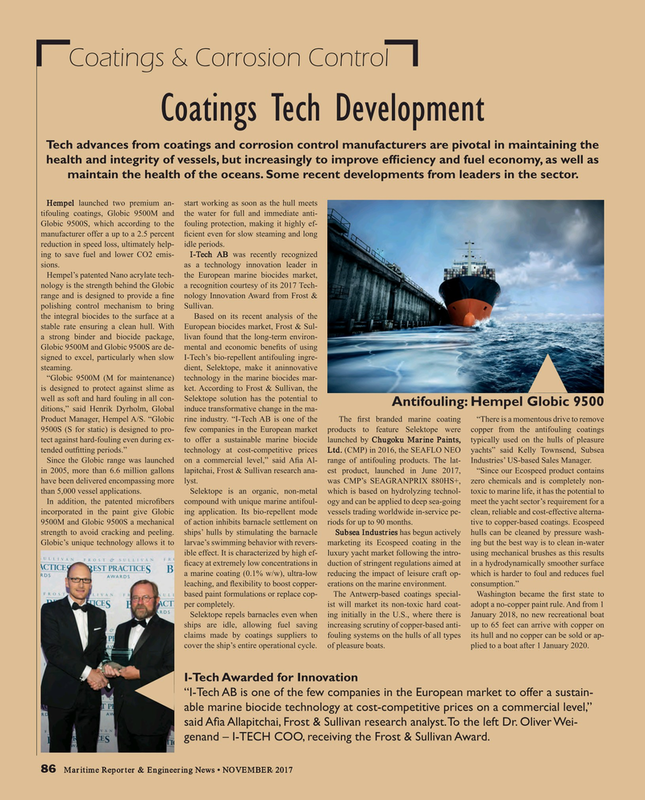 Tech advances from coatings and corrosion control manufacturers are pivotal in maintaining the health and integrity of vessels, but increasingly to improve ef? ciency and fuel economy, as well as maintain the health of the oceans. Some recent developments from leaders in the sector. Globic 9500S, which according to the fouling protection, making it highly ef- manufacturer offer a up to a 2.5 percent ? cient even for slow steaming and long reduction in speed loss, ultimately help- idle periods. Hempel’s patented Nano acrylate tech- the European marine biocides market, nology is the strength behind the Globic a recognition courtesy of its 2017 Tech- range and is designed to provide a ? ne nology Innovation Award from Frost & polishing control mechanism to bring Sullivan. Selektope repels barnacles even when ing initially in the U.S., where there is January 2018, no new recreational boat ships are idle, allowing fuel saving increasing scrutiny of copper-based anti- up to 65 feet can arrive with copper on claims made by coatings suppliers to fouling systems on the hulls of all types its hull and no copper can be sold or ap- cover the ship’s entire operational cycle. of pleasure boats. plied to a boat after 1 January 2020. I-Tech Awarded for Innovation “I-Tech AB is one of the few companies in the European market to offer a sustain- able marine biocide technology at cost-competitive prices on a commercial level,” said A? a Allapitchai, Frost & Sullivan research analyst. To the left Dr. Oliver Wei- genand – I-TECH COO, receiving the Frost & Sullivan Award.